Lonka, K. (2019). Plenary Panel: The university of the future: physical vs virtual. THE Innovation and Impact Summit, 3.4.2019, Daejeon, South Korea. Lonka, K. (2019). Keynote: Reforms of the Finnish education system. II Finnish-Russian Educational Forum, 14.3.2019, Moscow, Russia. Lonka, K. (2018). Keynote: Future Ready Education: Transformation in Curriculum and Teachers Development in Finland. Learning & Teaching Expo 2018, 12.12.2018, Hong Kong, China. Lonka, K. (2018). Keynote: Osaamisella tulevaisuuteen. WORK & HEALTH Research Seminar, 7.11.2018, Helsinki, Finland. Lonka, K. (2018). Keynote: Finnish school reform and phenomenon-based learning: the importance of physical activity. Back to Basics, 18.10.2018, Shenzhen, China. Lonka, K. (2018). Keynote: Growing minds – 21st century competences and digitalisation among Finnish youth? 14th Annual ACM Conference on International Computing Education Research, 14.9.2018, Espoo, Finland. Lonka, K. (2018). Keynote: Työnohjaaja – olet tärkeä! Suomen Työnohjaajat ry:n Työnohjauskonferenssi, 2018, 8.6.2018, Porvoo, Finland. Lonka, K. (2018). Keynote. Puhetta perustaidoista -seminaari, 5.6.2018, Helsinki, Finland. Lonka, K. (2018). Keynote. Global Education Technology (GET), 18.5.2018, Helsinki, Finland. Lonka, K. (2017). Invited lecture: Learning and education in the global and digital work? Presented in Ilona seminar, January 26, British Museum, England. Lonka, K. (2017). Invited Talk: Digital Transformation of Finnish schools Taking a Digital Leap. The 16th IFIP Conference on e-Business, e-Services and e-Society, November 23, Delhi, India. Lonka, K. (2017). Keynote: The Writing Process of a PhD Student – A Shift from the Concern over Language to the Concern over the Mind. Pre-seminar of the FinEd Network to the FERA 2017 Conference, Rovaniemi Finland, November 29, 2017. Lonka, K. (2017). Keynote: Miksi tunteet ovat tärkeitä oppimisessa? Tunnetta ja elämyksiä digiajan oppimiseen -seminaari, HY+, 12.10.2017, Helsinki, Finland. Lonka, K. (2017). Keynote: Visions for future teacher education. Dare to Learn, 6.9.2017, Helsinki, Finland. Lonka, K. (2017). Keynote: World Education 3.0 possibilities. World Education 3.0, 10.8.2017, Kirkkonummi, Finland. Lonka, K. (2017). Keynote: Recent developments in Finnish schools. How to promote creativity, motivation and engagement? LIFE2017, 19.1.2017, Rovaniemi. Lonka, K. (2017). Keynote: Education 4.0. Canon Future Book Forum, 27.11.2017, Poing, Germany. Lonka, K. (2016). Keynote: Sustainable Education Design from Finland. South Africa Innovation Summit, 22.9.2016, Johannesburg, South Africa. Lonka, K. (2016). Keynote: How can education play a role in developing democracy in society? IDEC2016, 9.6.2016, Mikkeli, Finland. Lonka, K. (2015). Keynote: E-learning is out – what is in, then? An invited keynote in Caperio satellite meeting of BETT2015 for Swedish delegates, January 23, 2015, Cumberland hotel, London, England. Lonka, K. (2015). Invited lecture: PhD. students’ conceptions of academic writing – what can quantitative analyses reveal? Presented in Quant Hub seminar, January 19, 2015, Faculty of Education, University of Oxford, England. Lonka, K. (2014). Keynote: How to engage university students? Developing new learning solutions for the future. In Oppimisseikkailu, Helsinki, Finland, March 4, 2014, . Lonka, K. (2014). Chairing the ICEEPSY2014 Conference, Cyprus, October 23-25, 2014. Lonka, K. (2014) Keynote: How to Engage the Learner? – new developments in educational psychology. ICEEPSY2014 Conference, Cyprus, October 23-25, 2014. Lonka, K. (2013) Keynote: Visions for the future of teacher education and schools in Finland. ACEL “The Future is Now” Conference, Canberra, Australia. October 2 – October 4, 2013. Lonka, K. (2013) Keynote: Oppilaitos vastuullisen toimijoiden yhteisönä – vuorovaikutus, motivaatio ja tunteet? ESEDU, Mikkeli, Finland. August 8, 2013. Lonka, K.(2013) Dinner address: Education Leaders Briefing, Microsoft, British Council. London, UK. January 30, 2013. Lonka, K. (2013) Keynote: Engaging learning environments (ELE) and learning contents for the future. The changing role of the teacher in evaluation process. International Exhibition and Forum for Education 2013, Riyadh International Convention & Exhibition Center. Saudi-Arabia February 18, 2013 – February 22, 2013. Lonka, K. (2012) Keynote: ELE, designing future learning environments. AEL for school principals. Lahti School district, Finland. March 7, 2012. Lonka, K. (2012) Keynote: Tulevaisuuden oppimisympäristöt – Asiantuntijaluento Suomen yrittäjille. Siltavuorenpenger, Helsinki, Finland. November 12, 2012. Lonka, K. (2012) Keynote: The future of learning – the changing role of the teacher. EEPG, Berlin, Germany. November 27, 2012. Lonka, K. (2012) Keynote: Designing an Engaging Learning Environment. ELE current state of the project. Haaga-Helia, Helsinki, Finland. March 2, 2012. Lonka, K. (2012) Keynote: Ikäihminen, design ja teknologia – riitasointuja vai sinfonista harmoniaa? KÄKÄTE (Käyttäjälle kätevä teknologia) & Toimiva koti. Musiikkitalo, Helsinki, Finland. November 1, 2012. Lonka, K. (2012) Keynote: Oppiminen tulevaisuudessa – opettajan rooli? OAJ (Finnish Teacher Union, seminar on teachers of the future), Opettamisen seminaari, Hakaniemi, Helsinki. November 2012. Lonka, K. (2012) Keynote: Kohti innostavampaa ja osallistavampaa yliopisto-opetusta. Opintori 2012, Oulun Yliopisto, Finland. December 13, 2012. Lonka, K. (2012) Keynote lecture: Educating digital natives: How to integrate innovative teaching and learning practises with ICT. Partners in Learning Global Forum 2012. Prague, Tsheck Republick, November 29 – December 1, 2012. Lonka, K. (2012) Keynote: Engaging Learning Environments for the Future. RYM Indoor Environment Seminar. RYM SY, Aalto Yliopisto, Espoo, Finland. April 18, 2012. 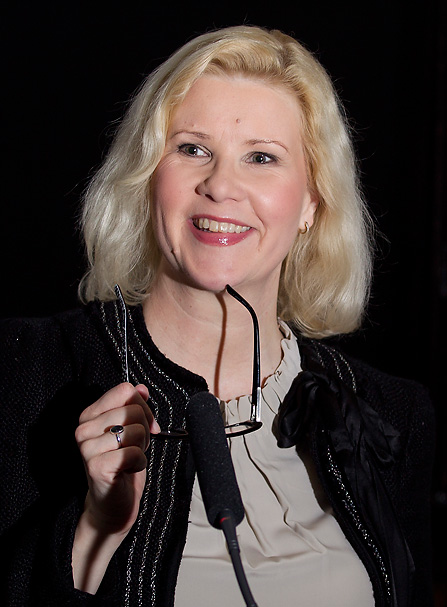 Lonka, K. (2012) Keynote: Ajattelen, olen siis töissä. Uuden kilpailukyvyn huippukokous/The New Spirit of Finland. Finlandia-talo, Helsinki, Finland. September 5, 2012. Lonka, K. (2012) Tulevaisuuden opettajankoulutus – miten vastaamme huomisen tarpeisiin? Educa-messut. Helsinki. January 28, 2012. Lonka, K. (2012) Invited speech for international press: Innovations in learning environments. Science Corner, Helsinki, Finland. April 17, 2012. Lonka, K. (2011) Engaging learning environments – blending physical, virtual, social and mental spaces of learning. Open Classroom Conference October 29, 2011. EDEN – European Distance and E-Learning Network. Athens, Greece. Lonka, K. (2011) Koulutuksen vaikuttavuus -seminaari. Finanssi- ja vakuutuskoulutus FINVA. Helsinki. November 25, 2011. Lonka, K. (2011) Keynote: Engaging learning. University Teaching as a Scholarship. Tarto, Estonia. January 25, 2011. Lonka, K. (2010): The Next Generation: Homo digitalis – How can we respond to their needs? An invited keynote in Dutch National E-learning Congress, High Tech Campus Eindhoven. February 3, 2010. Lonka, K. (2010): Keynote 3: New understandings of medical education and literate expertise, & Invited Workshop: Supervisions and Academic Writing. ASME, Researching Medical Education. The Royal Institute of British Architects, 66 Portland Place, London, UK. November 23, 2010. Lonka, K.(2010): New Innovations in Teacher Education. European Teacher Education Network (ETEN) Annual Conference 2010, Building schools for the future. Porthania, Helsingin yliopisto. April 15, 2010. Lonka, K.:(2010) Challenged by Innovation. Keynote lecture at ACSI – Aalto Camp for Societal Innovation Conference, Dipoli, June 28, 2010 (ACSI 2010 Proto Camp Dipoli June 28 – July 5, 2010). Lonka, K. (2010): Digital Media in education. In PDW Helsinki Conference. http://www.edu.fi/etwinning/pdw_Helsinki Metropolia, Helsinki. November 12, 2010. Lonka, K. (2010) Keynote at Reflektori 2010 – Tekniikan opetuksen symposium. OTE-hanke, Dipoli, Espoo, Finland. December 10, 2010. Lonka, K. (2009) Negotiating learning – how do you know that you have learned something? Keynote address. The Ninth Conference on Problem-Based Learning in Finland. Tampere, Finland. April 2 – 4, 2009. Lonka, K. (2009) New visions for learning. Higher Education: Re-Visioning for Recovery. The Path to Sustainable Development, EDUCATION LEADERS FORUM, UNESCO. Pasteur Institute, Paris, France July 9 – 11, 2009. Lonka, K. (2009) The Joy of Learning – New Approaches to Student Motivation. A keynote presented at ADEE Annual Conference, Association for Dental Education in Europe. Helsinki, Finland, August 26 – 29, 2009. Lonka, K. (2009) Innovative learning environments. 30 September, 2009. In Terms of Equity –Quality in for Teaching and Learning Congress. University of Helsinki, Palmenia Center Continuing Education, Finland. Lonka, K. (2008, July) Student learning, motivation and agency. Keynote in EARLI JURE Conference, Leuven, Belgium. July, 2009. Lonka, K. (2008) What Motivates the Learner? Keynote at NOFOMA Conference. E-learning in Global Education. June 4, 2008. Helsinki School of Economics, Helsinki, Finland. Lonka, K. Paradigms in medical education. 2008. February 11, 2008. Mini-symposium. Kanaris Lecture Theater, Manchester Museum, U.K.
Lonka, K. Motivation and emotion in medical education? February 11, 2008.Invited Mini-symposium. University of Manchester, Faculty of Medicine. Lonka, K. (2008) Activating teaching and innovative methods in educational psychology in teacher education. April 18, 2008. Tallinna Ylikooli- seminaari, Tallinn, Estonia. Lonka, K. Professional development –what motivates the learner? Keynote in Third professional lifelong learning conference: critical perspectives on CPD. June 24, 2008. University of Leeds, Business School, U.K.
Lonka, K. (2007) Student motivation – towards an integrated understanding of teacher student learning. An invited keynote Dutch National Teacher Education Seminar, April 23, 2007, Groningen, The Netherlands. Lonka, K. (2007) Reading and writing to learn. Some methodological challenges. A Paper presented at LLERA NETWORK SEMINAR: “READING AND WRITING TO LEARN IN SECONDARY AND HIGHER EDUCATION”, ORGANIZING RESEARCH TEAMS: LEAC-UB and SINTE-URL COORDINATORS: MONTSERRAT CASTELLÓ (Ramon Llull University) and ISABEL SOLÉ (Barcelona University) September 27 – 28, 2007, Barcelona, Spain. Lonka, K. (2007) Writing to learn, learning to write – How writing shapes thinking and thinking shapes writing. An invited keynote address in 4th Biennal Conference of the European Association for the Teaching of Academic Writing (EATAW): “Teaching Academic Writing Across and in the Disciplines”, June 30 – July 2, 2007, Ruhr-Universität, Bochum, Germany. Lonka, K. (2007) Future visions, challenges and threats in medical education. An invited keynote ASME (Association of Studies in Medical Education) Golden 50 Year Jubileum Conference, October, 17 – 18, 2007, Dublin, Ireland. Lonka, K. (2007) Finding the joy and motivation in learning. Invited Speech in the University Opening Ceremony, September 3, 2007, University of Groningen, The Netherlands. Lonka, K. (2007) Yliopisto-opiskelu –muuttuko mikään? (University student learning – is there really any change going on?) Invited presentation, PEDA-FORUM, May 25, 2007, Tampere, Finland. Lonka, K. (2005) Future of Learning. An invited keynote in AMKLC’05 Conference: Symposium on Adaptive Models of Knowledge, Language and Cognition (Hall: AS2), June 15 – 17, 2005, Espoo, Finland. Lonka, K. (1999) The Helsinki 2000 Curriculum: Challenges and solutions in transforming a traditional curriculum into PBL. An invited keynote lecture in symposium “Learning Models for the Future – Examples of Medicine (Lernmodelle der Zukunft – am Beispiel de Medicin). Hanns-Seidel-Stiftnung eV. Munich, Germany, March 3 – 5, 1999. Submitted for publication. Lonka, K. (1998) Active versus passive learning. An invited keynote in Life-Long Learning in Pharmacy, Copenhagen, June 10 – 13, 1998. Lonka, K. (1998) The 21st Century Student. A featuring keynote presentation. Improving University Teaching and Learning, Dublin, Ireland, July 6 – 9, 1998.